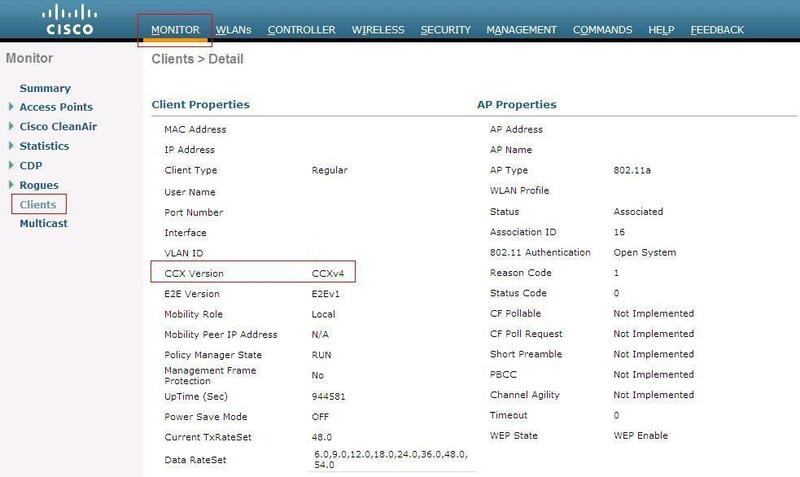 Control roaming behavior on your Cisco wireless network. | CCIE or Null! Control roaming behavior on your Cisco wireless network. Roaming is just another expectation from your end users. They expect to walk freely around the office to conference rooms or far off cubicles and have their laptop or handheld remain connected while downloading files or in the middle of a conversation. If the roaming process is not quick enough then you could see conversations and clients gets dropped forcing them reconnect to the WLAN, and I can guarantee you your end users will be calling. Now, if you have done a proper site survey and have solid data to work off of, you can control the roaming behavior of your WLAN clients. The reason you need to know the details of your wireless environment is because you are going to set RSSI limits concerning when your clients should begin looking for a new AP to associate to and, how quickly they are roam between access points. Just keep in mind, making these settings will effect the entire WLAN not just individual sections. I would also like to mention your clients should be CCXv4 or higher to take advantage of these features. To see if your clients are CCXv4 compliant go to Monitor -> Clients -> click on the client in question. 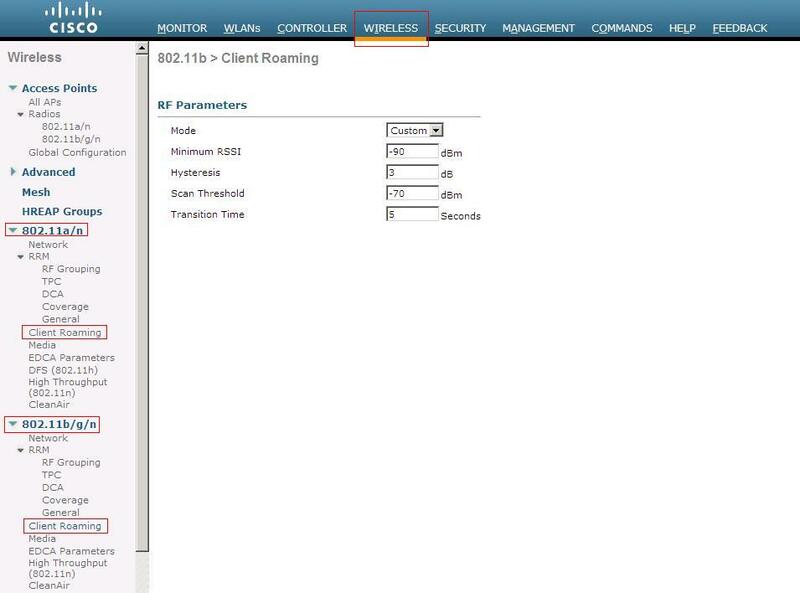 On your Cisco Wireless LAN Controller, you want to navigate to Wireless -> 802.11a/n or 802.11b/g/n (depending on which frequency you want to customize) -> Client Roaming. The first thing you need to do when you want to customize these settings is change the mode to custom this will allow you to edit the default values for the rest of the parameters. The next option is minimum rssi. If a clients RSSI value is below this threshold it will not associate/authenticate to the access point, instead it will continue to look for a better signal from different access points. Valid values for this field are -80 through -90. The understanding is that the signal strength/quality will be so low reliable communication will not be established. Next we have a setting called hysteresis this value is in dB and states how much stronger the signal of another access point has to be before a client decides to roam to it. This is useful if you have multiple access points in close proximity of each other or clients are moving between the edge of coverage of different access point. The higher this value the closer a client needs to be to an access point for it to associate to the second access point. Valid ranges are from 2 through 4 dB. Now we have the scan threshold this is another RSSI value range. When the wireless client’s RSSI drops below this threshold the client will begin actively scanning for another access point it can receive a stronger signal from. Valid values range between -70 through -77. The last field on the page is the transition time this is the amount of a client is going to see a better signal from neighboring access, before it attempts to associate to the second access point. The client determines a better signal when its RSSI drops below the scan threshold and it sees a signal from a neighboring access point higher than the scan threshold. So all these factors do work together and can be customized for your environment. Normal data traffic is more forgiving since it’s not as delay sensitive, but If you have voice on your WLAN you will want to fine tune these settings to avoid dropped calls. « The Cisco PPDIOO Life Cycle. Preety good post about Control roaming behavior on Cisco Wireless network.